According to official documents, Hurricane Harvey victims reportedly have to agree to not "boycott Israel," in order to receive aid to rebuild their homes. As the Americans who were affected by Hurricane Harvey attempt to rebuild their homes and replace their belongings, they have the option to request help from the city they live in—but residents in Dickinson, Texas, are learning that their city’s “Harvey Repair Grant” comes with a strange clause. 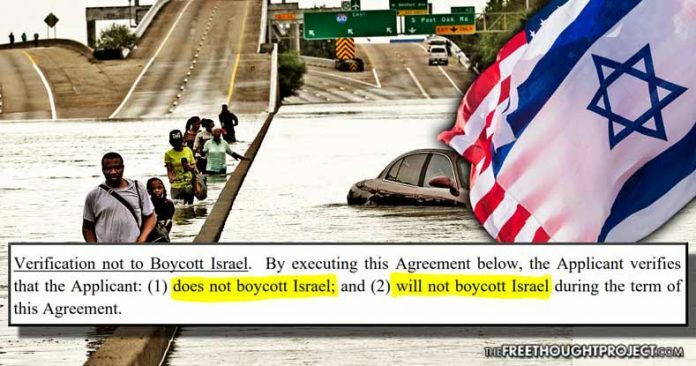 According to a document titled “Hurricane Harvey Repair Grant Application and Agreement” from the City of Dickinson, in addition to a requirement that the applicant “must adhere to all applicable rules, regulations, and laws, including building codes, safety rules and securing of all required permits,” there is also a “verification not to boycott Israel” agreement. The American Civil Liberties Union released a statement criticizing the requirement and noting that while “the city appears to be enforcing a recently passed Texas law that requires all state contractors to certify that they are not participating in boycotts of Israel,” it is still a clear violation of the First Amendment. In addition to the problems that stem from the fact that requiring Americans to agree to not “boycott Israel” is in direct violation of their rights to free speech guaranteed by the First Amendment, it is also a broad term that can be defined in a number of ways. Does agreeing not to boycott Israel mean that one specifically agrees not to support the Boycott, Divest, and Sanction Movement against Israel, or can the meaning be as broad as to include that one agrees to not criticize the Israeli government, the blockade it has imposed on Palestine, or even the nearly $4 Billion the U.S. sends Israel in military assistance each year? In the following video, former Texas Congressman Ron Paul looks at the proposed Israel Anti-Boycott Act and notes that even some Americans who support the United States’ close relationship with Israel, have criticized the act for violating the First Amendment.